MAC Cosmetics, or "Make-up Art Cosmetics," is a well-respected makeup brand based in New York City. MAC sells all the makeup essentials, from primer to nail lacquer to lipgloss. 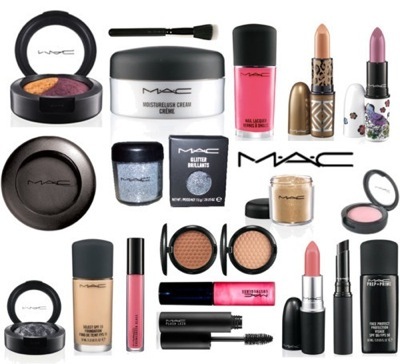 MAC makeup is used by professional makeup artists and casual makeup users alike. Their products come in a wide variety of colors, from pale nudes to bright colors. Color-wise, the company often experiments; in 2009, they even released a line of black lipstick! This brand is typically sold in high-end department stores like Macy's, Nordstrom and Bloomingdale's. They also have their own stand-alone stores, as well as an online shop. MAC does not test on animals. However, their company does feature animal products. If this is an issue for you, please call them at 1-800-387-6707 and ask them which of their products, if any, are vegan, since new products are always coming out, often with different formulas. This brand runs on the pricey side. Their cheapest products are their nail lacquers, which cost $12. Their lipsticks, their most popular products, cost $14. Everything else they sell is in the $14-45 range. However, you can find them for cheap, online, without buying knock-offs or used products. The MAC AIDS fund, a charity run by this company, gives money to AIDS prevention and treatment in the United States. MAC's Viva Glam lipsticks donate the entire purchase price to this fund, as well as other AIDS charities. The MAC PRO program is a service for makeup artists and professionals in the makeup industry. For a fee, you get a discount on MAC Cosmetics, as well as master classes, access to invitation-only "Pro-to-Pro Parties" and complimentary shipping. MAC also sells makeup brushes. These brushes can be used for powder, foundation, eyeshadow, eyeliner application, lipcolor application, blending, contouring, highlighting––you name it! Check out their brushfinder for more details.